Meet Joe. Joe, like you, has big plans for the upcoming year. 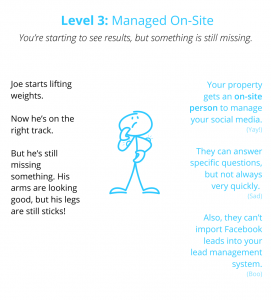 You want to start capturing leads from Facebook and Joe wants to get buff. Strange as it sounds, you and Joe have a very similar path to success. We have broken this journey into 5 levels of maturity. As we go through these levels, we want to you identify where your company resides and understand where it can go. One important thing to remember is that each level is good. Progress is progress and it can take a long time before your company is ready to take the next step in maturity. Joe joins a gym. (Yay, Joe!) This is the first step to getting in shape, however, joining a gym is not enough. He needs to put his gym membership to use if he wants to see any results. 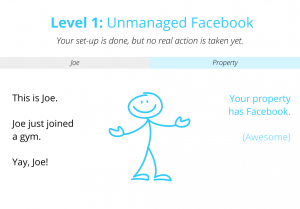 A property at Level 1 has created a Facebook page, but does not have anyone responsible for managing the page. Having a Facebook page can add credibility to property and can be an additional source of information for interested prospects. However, it doesn’t do much more than that. 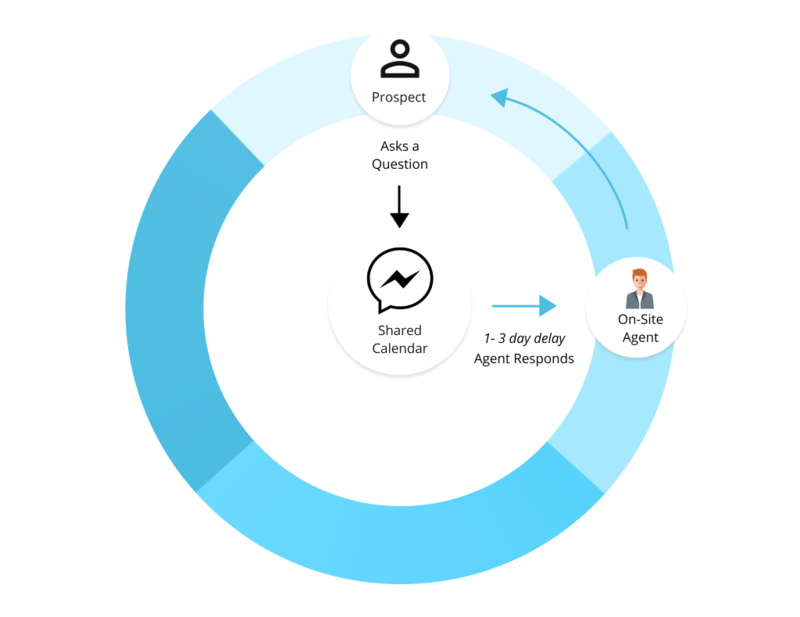 Additionally, prospects who don’t receive responses to their inquiries might become uninterested. At Level 2, Joe shows up to the gym ready to workout. Since he has never done a formal exercise plan, he doesn’t know how to create a workout regime specific to his body type or how to use most of the equipment so he jumps on a treadmill. While running is a great exercise for heart health, it isn’t going to help Joe to achieve his goal. Properties at Level 2 fall into the same trap. 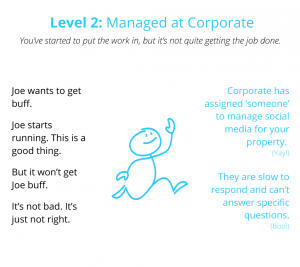 The second level of maturity requires a social media manager from corporate to field questions specific to your property. Given the sheer number of inquiries this individual is responsible for handling on top of their other responsibilities, it is safe to assume the response time leaves something to be desired. Also, this individual is not well-versed on the ins and outs of your property. Prospects are most likely going to be directed to the website, instead of receiving an immediate answer to their questions. 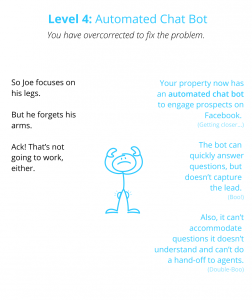 Like Joe, this is helpful for the overall idea of providing responses to prospects. However, it isn’t going to do much for your goal to convert Facebook inquiries into hot leads. At Level 3, Joe starts lifting. Finally, he is starting to see the results he wants, but something is still missing. The more he works out the more lopsided he starts to appear. Joe has been so focus on his bi’s and tri’s he didn’t think about leg day. Similarly, a property at Level 3 has an on-site employee answering Facebook inquiries. These responses are helpful and they can even suggest prospects submit their information. The drawback is that on-site employees are already busy. Response times are irregular. Like Joe, this property has solved one issue, but is still unable to reach the overall goal. At Level 4, Joe over-corrects his mistake. Now he works on his legs every trip to the gym. His arm muscles have taken a backseat and it is starting to show. 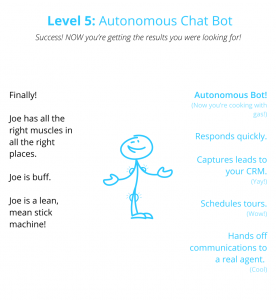 At Level 4, a property has added an automated chatbot. Now, every prospect receives a response immediately, 24/7. Just like Joe, these properties have made a trade-off. They now have a great response time, but they have sacrificed the response quality. At the final level, Joe has learned how to balance his fitness plan. He now alternates between legs and arms. Not only has he reached his goal to bulk up, he also has started to convert his good looks into head turns. 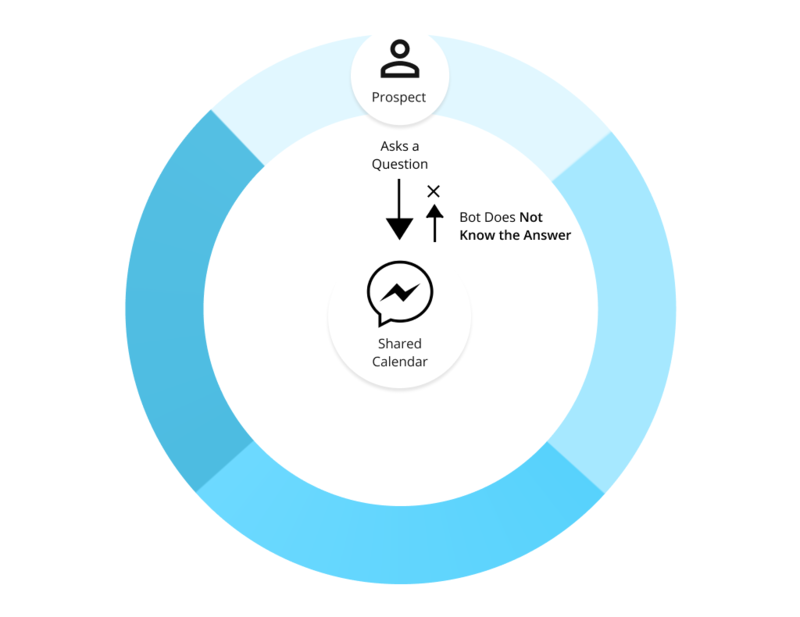 An autonomous chatbot creates a balance between managing inquiries on-site and with a chatbot. Also, this is the only level where you can accomplish your goal of converting Facebook inquiries into leads! A new year means new plans. Whether your plans consist of exercising more or to start turning your Facebook messenger into a lead generation tool, you follow a similar process. We’ve created the road map. All you need to do is understand where you are and decide where you want to go, and put in the work. Social media marketing is only as good as the work you put into it. Getting a gym membership isn’t going to get you a six-pack, just like making a Facebook page isn’t going to get you more leads. Committing daily to exercising regularly is how you are going to build the muscle you want. 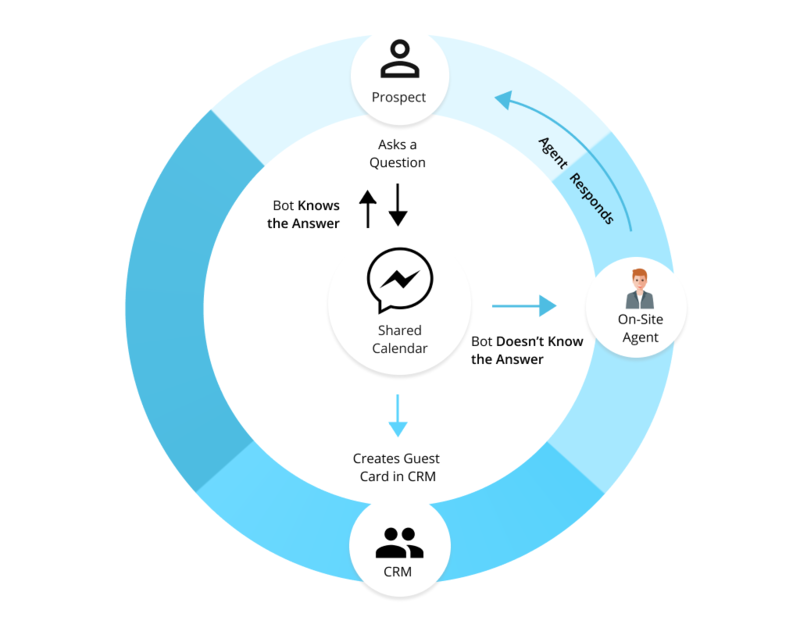 The difference is, converting inquiries to hot leads can be done autonomously!